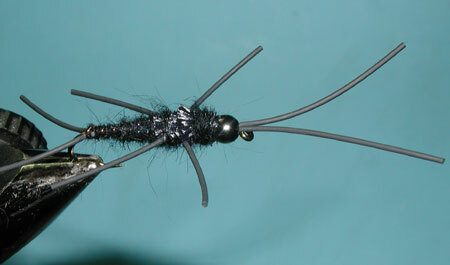 Notes: Black Rubberlegs, also known as the "Ugly Bug", represent Stoneflies and are particularly good within deep pockets of streams. Just prior to a stonefly hatch, nymphs will migrate towards shore and be found clinging to rocks close to shore. 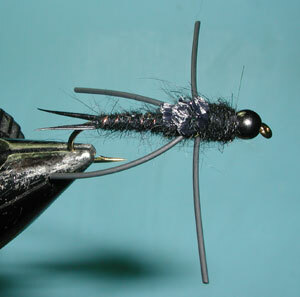 The best locations to fish these nymphs are in the adjacent deep and fast waters using a weighted nymph pattern. Also, try an unweighted pattern with an indicator in the shallows between the fast water and the bank. 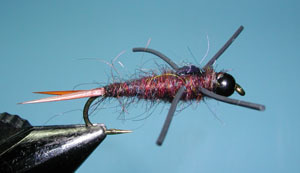 You can use a particular color of thread with the head to designate the weight of the nymph. 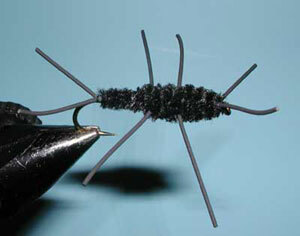 The black rubber hackle material used for the tail, legs and antennae give plenty of attractive action to this fly. Bending the hook slightly gives a more realistic sillouette. High-Stick Nymphing is a particularly good way to fish this fly within pocket water where the drifts are short. Weight: Leadfree wire , 020"